When creating a professional portfolio, you will likely want to add work that you have previously uploaded to Chalk & Wire. Rather than uploading all of the work again, you can simply import the work from another portfolio, collaborative workspace, or assignment. 1. Click on the Import Content button, which can be found on the right-hand side of your portfolio page. 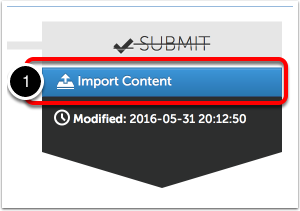 You may import content from any Portfolio, Workspace, or Assignment within your Chalk & Wire account. 2. 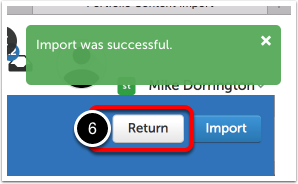 Select from where you would like to import content. The 'Choose a Portfolio/Workspace/Assignment' drop-down menu will change depending on your selection above. 3. Select the Portfolio/Workspace/Assignment from which you would like to import content. 4. 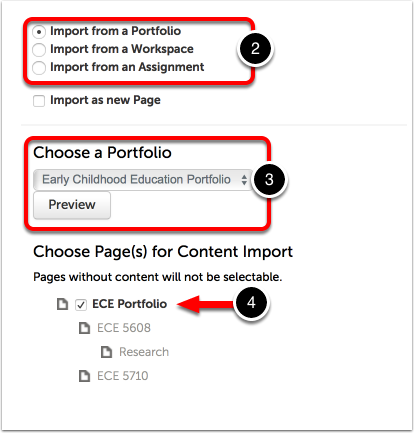 Select the section of the Portfolio/Workspace/Assignment that contains the content that you would like to import. Sections that do not contain content will not be selectable. A confirmation message will appear in green. 6. Click Return to return to your portfolio page and review the imported content.